Hillary Clinton's visit to Pakistan will include media outreach, a town hall and meetings with civil society and business leaders. Islamabad, Pakistan (CNN) -- Secretary of State Hillary Clinton arrived Wednesday in nuclear-armed Pakistan, a country hit hard by terrorism, economic crisis and rising sentiment that it is paying too high a price for its partnership with the United States in fighting extremists. Clinton is expected to meet with top Pakistani officials, including president Asif Ali Zardari, but a major challenge during this visit is to convince Pakistanis that the U.S. wants a partnership that goes beyond fighting al Qaeda and other extremist groups. Talking with reporters en route to Pakistan, Clinton said she wants to "turn the page" on what has been, in the past few years, "primarily a security-anti-terrorist agenda." "We hold that to be extremely important, and it remains a very high priority," she said. "But we also recognize that it is imperative that we broaden our engagement with Pakistan." Clinton said there have been misconceptions about American intentions. "We have a relationship that we want to strengthen, but we don't want it to be lopsided. We don't want it to be just about security and just about our anti-terrorist agenda," she said. "It is unfortunate that there are those who question our motives, who perhaps are skeptical that we are going to commit to a long-term relationship, and I want to try to clear the air up on that while I am in the country," she said. Nine months is not a lot of time to turn around a relationship that has a lot of scars to it. --Secretary of State Hillary Clinton on Pakistan and the U.S.
Clinton said there has been "real progress in creating a base of trust that we are going to build on, but it is still a relatively short period of time. Nine months is not a lot of time to turn around a relationship that has a lot of scars to it ... there's just a lot of scar tissue." At least 90 people -- most of them women -- were killed Wednesday in a Pakistani marketplace when a car packed with 330 pounds (150 kilograms) of explosives detonated at Peshawar's Meena Bazaar, according to North West Frontier Province's information minister Mian Iftikhar Hussain. Clinton blasted the militants responsible for the attacks while speaking at a joint news conference with her Pakistani counterpart in Islamabad. "If the people behind the attacks were so sure of their beliefs, let them join the political process, let them come forth to the people and make their case that they don't want girls to go to school, that they want women to be kept back, that they believe they have all the answers," Clinton said. "They know they are on the losing side of history, but they are determined to take as many lives with them as their movement is finally exposed for the nihilistic, empty effort that it is." Clinton denied the recently enacted Kerry-Lugar foreign aid bill, which gives Pakistan $7.5 billion over five years, sets conditions on Pakistan that impinge on its sovereignty. "They are not conditions on Pakistan so much as they are metrics for measuring whether we think our aid is being productive," she said. Pakistan has several dozen nuclear weapons, and Clinton said she will discuss nuclear proliferation while in Pakistan. "We do believe the arsenal is safe," she said, but we do worry about proliferation." 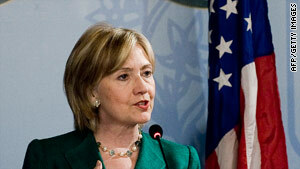 Clinton also praised Pakistan's military operations under way in South Waziristan. "We believe that what the Pakistanis are doing in standing up to extremism in Pakistan is in our national security interest. "I think it's important for Americans and others to recognize the high price the Pakistanis are paying," she said. U.S. officials earlier this year publicly doubted the government's resolve. But Clinton, in two interviews with Pakistani television networks released as she arrived, she said the operation in South Waziristan "appears to be a very well-planned and implemented effort to go after those who threaten Pakistan." Clinton confirmed the United States is evaluating engaging with Taliban factions willing to disassociate themselves from al Qaeda. "What we want to do is separate those out," she said, "and we're going to engage in that and will look to the government of Pakistan -- particularly the military and intelligence services -- to help guide us in that." Clinton's trip comes at a critical time as President Obama draws closer to deciding on his strategy on Afghanistan, which is closely tied with stopping Taliban and other extremists who take refuge in Pakistan, crossing the border to fight in Afghanistan. Her trip will include a major outreach to the Pakistani media, a town hall with students and meetings with Pakistan's civil society and business leaders. In her Pakistani television interviews, the secretary went out of her way to stress that she has close Pakistani friends, loves Pakistani food and enjoys dressing in the traditional "shalwar kameez," a tunic and trousers, the Pakistani version of a pantsuit.